Dixon, Belisle, and Stanley, (2018) demonstrated a strong, significant relationship between derived relational responding and intelligence in individuals with autism. We extended these results by evaluating the degree to which participant results on the PEAK Equivalence Pre-assessment (PEAK-E-PA, a direct assessment of derived relational responding) mediated the relationship between the PEAK Direct Training Assessment (PEAK-DT-A, a Skinnerian-based assessment of verbal development) and intelligence. Results support strong, positive correlations between both assessments (PEAK-DT-A and PEAK-E-PA) and IQ; however, the relationship between PEAK-DT-A and IQ could be explained in terms of participant results on the PEAK-E-PA alone. This finding corresponds with Relational Frame Theory, suggesting that derived responding can provide a behavioral interpretation of intelligent behavior, as well as Skinner’s elementary operants. Informed consent was obtained from the participants, agencies, and/or legal guardians of all participants included in this study. The second author receives small royalties from sales of the PEAK curriculum. The other authors declare that they have no conflict of interest. Sidman, M., & Tailby, W. (1982). Conditional discrimination vs. matching to sample: An expansion of the testing paradigm. 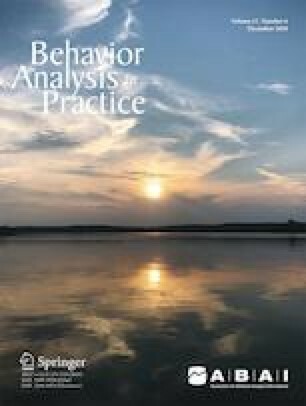 Journal of the Experimental Analysis of Behavior, 37, 5–22. https://doi.org/10.1901/jeab.1982.37-5.